I’ll be out there working at Pridefest today wearing this shirt under my uniform for a lot of reasons. For all of the cops I have worked with over the years, including one of the best partners I’ve ever shared a sector car with. For my classmate in High School whose parents made him sleep in a tent in his yard. For every call I went to where someone got kicked out of their house or whose family just didn’t understand. 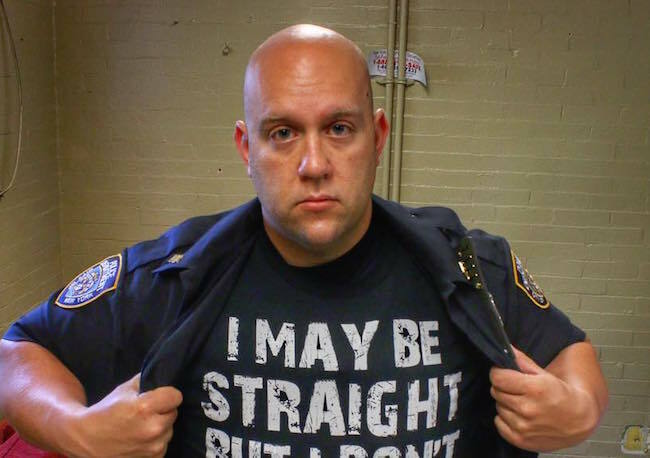 It’s people like this cop that makes people feel safe to be them selves. I wish there more like him. OK, brought tears to my eyes. He may be big, he may be overweight, but he ain’t a loser. He is winner in my book. A pig in a uniform is still a pig. Oh how quickly you [email protected] forget who exactly it was raiding your bars and places of refuge and beating you over the head with batons. How you forget that the first pride was a riot against police brutality. But I guess as long as they are pointing their batons at the right people you don’t mind. If we didn’t have police, who would’ve stopped the gunman at the Pulse nightclub? Pull your head out of your backside Amadeus. So I’m supposed to be happy a cop did the job taxpayers pay him to do? Yeah the have jobs unlike most of the thugs that don’t like them. Outside the ghetto that’s something to be proud of. Sometimes, one is just embarrassed by what a fellow traveler says. Yes, because we all know how many bars you were arrested in, like, 50 years ago! Surprised you’re not dead yet! Just so you know, there are people outside to “ghetto” that are more than a little alarmed about the state of law enforcement in America. I wouldn’t go as far to call a cops a pig, and I am very appreciative of the heroic work the police did at the pulse night club. However, that doesn’t erase the fact that there are serious issues that need to be addressed in the way that some in law enforcement interact with people of color. Just so you know the little white liberal extremists that cheer on BLM aren’t actually concerned. They just jump on all the fads. Not wrong to point out present day issues with police, but unless this officer has a history of excessive force or unprofessional conduct, THIS AIN’T THE SUBJECT HERE! Lose weight? He’s a hotty. For all the reasons he’s out there working Pridefest, he forgot to mention the most important one. He looks fine. He does not need to lose weight. I am a bit concerned why he’s marching for a Roman Catholic priest though? A lot of them are pedos. This cop is a winner in every sense of the word!!!!! Now, THAT’S what a real man is!!! That was a very moving statement from this cop. Reading some of the comments here, it’s really sad and pathetic that there are those cynical assholes who can turn the most positive story into a negative one. Some of you act like the entire world is out to get us. If a straight person is an ally, he’s only an ally because he have some ulterior motive, like someone here commenting that this cop is only working the pride parade for overtime. If a corporation is an ally, it’s only because they want our dollars. Well, duh!!! Of course they want our money. They are in the business of making money, aren’t they? But they’re also supporting their LGBTQ employees. Yes, there are problems in law enforcement when it comes to dealing with minority groups. But this particular story is about one of many chips in our country that are supportive of the LGBTQ community, so let’s just celebrate that. The police (at least this one )is your friend. A long way from Stonewall.